Gotham City's rich and powerful have been living in fear lately. What is scaring these elite people? The fact that their money, jewels, and other valuables are vanishing. They don't know where they have gone to because they had them locked away thinking they were safe, but they still disappear into the night. Little do they know that Selina Kyle has been making their riches her very own! 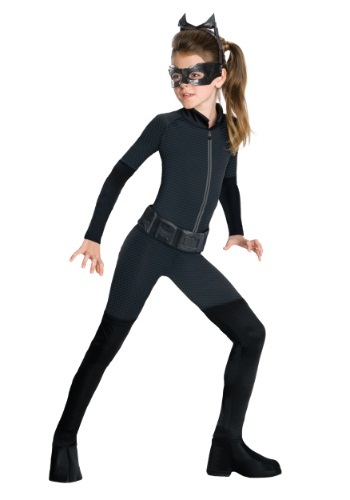 If you think your tween girl would like to explore her villainous side, just let her try out this Catwoman costume. It's officially licensed and designed directly from the character's appearance in The Dark Knight Rises. Featuring a graphic printed polyester jumpsuit, this ensemble also comes with a belt, eyemask, and headpiece. And the suit features built-in boot covers to complete the head-to-toe look! We highly encourage her to have fun portraying a classic DC Comics character by taking a spin in this cool costume. But, we have to advise that we think it's best if she doesn't actually try to start robbing the rich folks in your neighborhood. Because we suspect Batman might show up with something to say if missing jewels start showing up in your home!